7 hours long. Price is $1075 per person in a party of two. For larger parties, please see complete price table below. Your guide will pick you up for a 7 hour privately escorted tour. Explore the mysterious ancient site of Akrotiri. Visit a vineyard and taste some local wine. Stoll the charming lanes of Oia and Fira. Visit the archaeological site of Akrotiri, a Bronze Age, Minoan settlement. Some historians hold this settlement, as well as the disaster that left it unknown to most of history, to be the inspiration of Plato's story of Atlantis, as mentioned in his dialogues Timaeus and Critias. Akrotiri was buried in ash by the massive Theran volcanic eruption in the middle of the second millennium BCE. Like Roman Pompeii, Akrotiri is remarkably well-preserved. Frescoes, pottery, furniture, advanced drainage systems and three-story buildings have been discovered at the site. Continue to a winery for a tour and sampling of the famous local wines, local cheese and traditional snacks. Drive to Oia for a tour of this beautiful village, situated at the northern-most point of Santorini, with magnificent views over the volcanic islets and caldera. 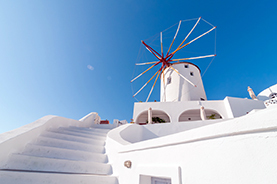 Stroll the picturesque lanes of Oia, with their ochre houses and characteristic blue, dome roofs. Continue to Fira, the main center of the island. After a walking tour with your guide, you will have some free time to explore and shop. * For touring on Sundays and holidays, a $645 supplement applies per travel party (not per person).